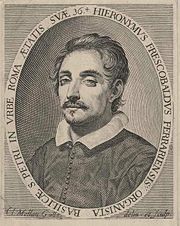 Girolamo Frescobaldi (baptized mid-September 1583 in Ferrara – March 1, 1643 in Rome) was an Italian musician and one of the most important composers of keyboad instrumental music in the late Renaissance and early Baroque music periods. There is no evidence that the Frescobaldi of Ferrara was related to the homonymous Florentine noble house. As one of the pioneers in modern rhythmic notation, Frescobaldi made it easier for musicians to expand on rhythmic concepts without the rigidity of the earlier notational systems. Frescobaldi offered musical rewards in the intrinsic and extrinsic areas of performance and development. Thus, he created a more rewarding experience for musicians, as well as the audience, while striving for excellence in the world of music. 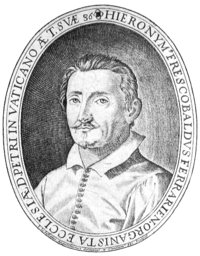 Girolamo Frescobaldi was born in Ferrara in 1583. He studied under the organist and famous madrigalist Luzzasco Luzzaschi at Ferrara. Luzzaschi became known for his outstanding vocal output which he scored for one to three sopranos over an instrumental bass. Luzzaschi also was one of the first to write out the ornamentations in his pieces leaving nothing, which was discretionary to the musician. Luzzaschi as well as Frescobaldi were also considered to have been influenced by Carlo Gesualdo, who was in Ferrara at the time. Gesualdo's music, which contained quick modifications to the tonality and harmony bringing about a new emotional intensity, inspired both Frescobaldi and Luzzaschi, especially in their secular vocal and sacred vocal pieces. Frescobaldi's patron, Guido Bentivoglio helped him obtain the position as an organist at the church of Santa Maria in Trastevere in Rome in the spring of 1607. Frescobaldi travelled with Bentivoglio to the Low Countries before Frescobaldi became organist of St Peter's in Rome in 1608, a post he held until his death. From 1628 to 1634 he was organist at the court of the Medicis in Florence. He wrote a large number of works for the organ and harpsichord, including toccatas, capricci, fantasias, canzonas, ricercares (a generic name for any contrapuntal piece), dances, and variations. Among his best known works is the Fiori musicali (1635), a collection of organ works designed to be played during the mass liturgical service. He published two books of toccatas between 1615 and 1637, which contain the Cento Partite, one of his most virtuosic and experimental works. His vocal music, which includes a number of masses, motets, and madrigals, and his instrumental music, is less well known, in spite of the "1st Volume of Canzoni to be played with any type of instrument" published in 1628. Frescobaldi was one of the inventors of the modern conception of tempo, making a compromise between the ancient white mensural notation with a rigid tactus and the modern notion of tempo, which is characterized by acceleration and deceleration within a piece. His music was a very important influence on later composers, among them Johann Jakob Froberger and Johann Sebastian Bach. Bach is known to have owned a copy of Frescobaldi's Fiori musicali. He is sometimes jovially referred to as the "Frisky Bald Guy" in musicological circles. A pun off his name, it is a fitting description of his characteristically sporadic style of composition, and the receding hairline that is evident in his later portraits. A piece attributed to Frescobaldi, a Toccata for cello and piano, was actually written by Gaspar Cassado. ↑ Medieval, Renaissance, and Early Baroque Music Composers. Retrieved December 4, 2007. All links retrieved June 22, 2017. This page was last modified on 22 June 2017, at 20:47.